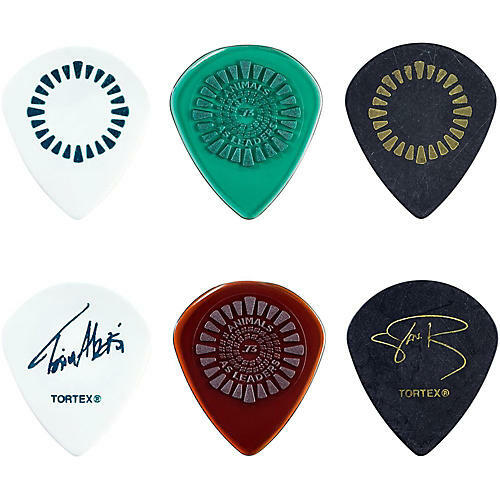 The Animals as Leaders Pick Tin comes with all the picks Tosin Abasi and Javier Reyes use to compose their dynamic, finely crafted prog masterpieces. With two custom grip Animals as Leaders Primetone Jazz III XL .73mm Picks, two Tosin Abasi Signature Tortex Jazz III XL .60mm Picks, and two Javier Reyes Signature Tortex Jazz III XL .73mm Picks, you’ll have the speed, control, and precision you need to craft chugging riffs and intricate leads of your own. See what new picks can do for you. Order today.